Introducing the LVE Collection by John Legend. 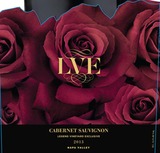 The perfect harmony of passion, eloquence and Napa Valley tradition, LVE wines are a unique series of rich, soulful and complex notes inspired by true love, produced in collaboration with Napa Valley's renowned Raymond Vineyards. Our inaugural 2013 Cabernet Sauvignon opens with enticing aromas of dark fruit and cocoa. Blackberry, black licorice and oak flavors envelop the palate with hints of warm mulling spices and chocolate. Complex and powerful, this wine has a long, luxurious finish. Pure, rich and graceful, with a charming core of blackberry, currant and oak, this wows with finesse and refinement, hitting the high and low notes with equal comfort. Drink now through 2027. This is singer/songwriter John Legend's inaugural wine project in conjunction with Raymond Vineyards in the Napa Valley. Combining 85% Cabernet Sauvignon with 15% Petit Verdot, it tells a powerful story in thick layers of blackberry cobbler, chocolate and coffee, the tannin and oak integrated and silky smooth. This is a wine of great presence.